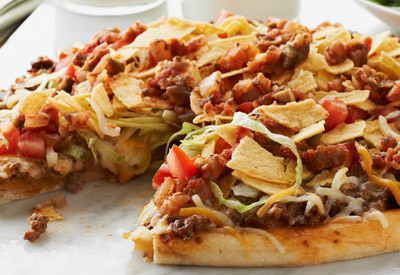 Can't figure out if you're in the mood for pizza night or taco night? Choose both, then stand firm. Someone's gotta make the hard decisions. 10%DV vitamin C, 20%DV calcium, 20%DV iron. Cook meat with taco seasoning mix as directed on package. Spread onto pizza crust; top with cheese. Place directly on oven rack. Bake 8 to 10 minutes or until crust is golden brown and cheese is melted. Top with lettuce and tomatoes. Crush Taco Shells; sprinkle over pizza. Drizzle with salsa. Serve with fresh fruit and a side salad to round out the meal. Serve this kid-friendly meal with baby carrots and bell pepper strips. Substitute 1 pkg. (1-1/4 oz.) TACO BELL® HOME ORIGINALS® Taco Seasoning Mix, 6 TACO BELL® HOME ORIGINALS® Taco Shells and 1/2 cup TACO BELL® HOME ORIGINALS® Thick 'N Chunky Salsa for the taco dinner kit.